Walk down any street in Bangalore and you’re sure to come across a ‘puncher shop’. This may be an actual small shop or just a dedicated space on the sidewalk. Instead of someone wearing boxing gloves, you’ll find a man repairing bicycle tires. For some reason, ‘puncture’ is systematically misspelt; that’s just one of the quirky quirks of India. Cars, trucks, scooters, motorcycles, bicycles, pushcarts all have rubber tires which get invariably punctured at some point or other. 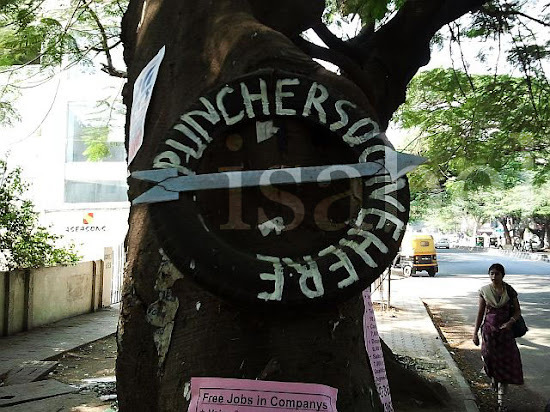 The ‘puncher shops’ provide a handy roadside service, anywhere, and almost anytime. The Hindu has an interesting weekly column called “I am” which features “men and women who make Bangalore what it is.” I enjoy reading these little personal vignettes about ordinary people doing ordinary jobs like vegetable vendor, paper collector, brick maker and yes, puncture repairer. Recently the column featured T. Balasubramanyam, a puncture repairer with his own shop in Malleswaram. He reveals a few details about his daily job. He keeps busy from morning to night, repairing up to 20 flat tires a day. You can read more about him and what goes on in a ‘puncher shop’ here.